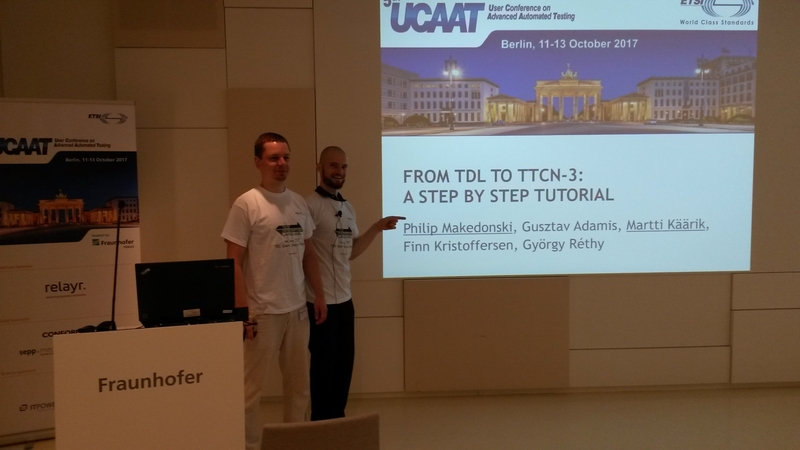 5th UCAAT was held in Berlin, Germany October 11-13, 2017. During 3 days 4 interesting tutorials, 2 keynote speeches and 28 presentations introduced different testing problems, new trends and achievements in testing industry. – 1 poster Modernizing TTCN-3 (J.Grabowski, G.Réthy, K.Szabados, T.Urban, J.Deltour, J.Wieland). 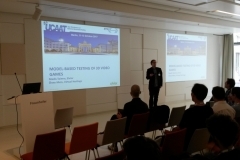 Besides TDL and TTCN-3 also Madis Taimre presentation – Model-based testing of 3D video games – was very much appreciated by the audience. The presentation summarized how MBT (Model based testing) and TTCN-3 can be effectively used in system testing of 3D games developed on Unity platform. Open source framework for applying TTCN-3 in Unity game test automation was developed; MBT was applied for generating TTCN-3 scripts and as a result better test coverage was received compare to the manual scripting. The presentation could be downloaded here. TOP project launched at UCAAT 2017. 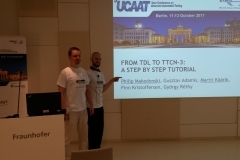 TDL (Test Description Language) Open Source Project (TOP) was successfully launched at UCAAT 2017 (Berlin October 11-13th). Now everyone can contribute to TDL tooling and also gain from applications already developed for TDL. Elvior has been a key contributor to the TOP and we will continue to work with our partners to help make TDL available for testers around the world More information can be found here. Please also take a look at TDL tutorial. Also new features, improvements and bug fixes are included to the new build. For detail please see release notes..
Windows and Linux installation packages are available for customers in designated areas at online support. For evaluation please contact sales@elvior.comor fill contact request form here. The most popular programming language has made its way to model based testing! Use Java objects and method calls from source project or external libraries to model your test behavior. Render tests for execution in JUnit framework or create your own testing interface. The use of object-oriented language requires object-oriented modeling. And now you have it! Instance method calls are automatically linked to available objects. Expected values of method return values are converted to appropriate assertions in test code. Model views have gained some weight. With content specific filtering and view-to-view navigation it’s easier than ever to step through your models and find what you are looking for. Step-by-step navigation includes highlighting and focusing on related elements on behavior diagrams. Test generator is now able to produce independent test sequences for test objectives, so you have better control of the test execution process. Each test generation task focuses on specific objectives and yet produces single compact test suite model for optimal test management. Previously generated test sequences may become invalid when the data or behavior change. Such discrepancies are now detected and reported on the fly. All resource consuming model processing tasks have now been delegated to the server, so your precious processor cycles are kept for what is important to you. Most model objects may now be placed in packages to help you organize your assets and create a clear separation of concerns where needed. UCAAT 2017 programme is online! 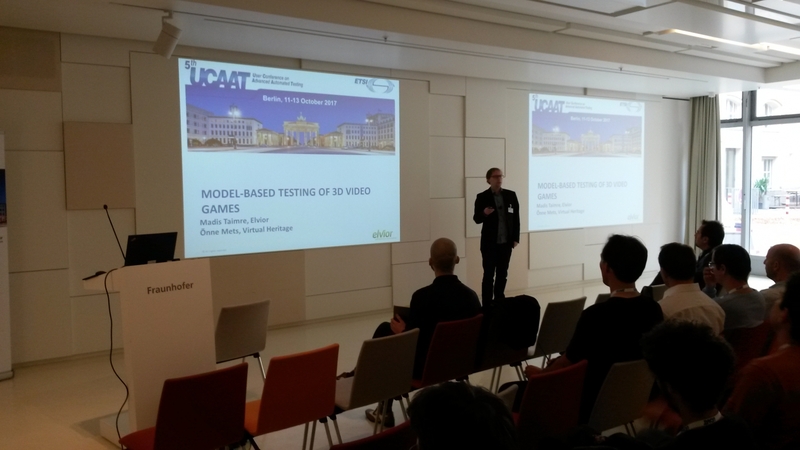 The fifth User Conference on Advanced Automated Testing (UCAAT 2017) is taking place in Berlin, Germany on 11-13 October 2017 and hosted by Fraunhofer Focus. Conference programme is available online – check it out here: https://ucaat.etsi.org/2017/programme. TestCast MBT in video games testing. Elvior has developed model based testing solution for games made with Unity® software. MBT (model based testing) is proved to be more effective approach for testing games due to the high abstraction level, which makes the test suite easily maintainable and to be used for regression testing a game in development. The TestCast package offers an out of the box testing solution for games made with Unity® software. The package includes modeling tool, test executor, adapter communicating with the SUT and scripts, which should be added to the game. TestCast MBT offers a high abstraction level and the approach can be used with game development platforms other than Unity® software. As test modelling projects become larger the amount of imported data – such as variables, type definitions and test data – keeps growing. With new model view and property pages you have a good overview of your assets. Models are strongly typed and modeling language has semantic rules that prevent creation of unreasonable test cases. Those rules were previously checked by the server. Now, the model is validated in the client and errors presented in Problems view, thus saving the round-trip time to server. With requirement editor it is now possible to organize requirements and associate them with test objectives. If you are using another requirements management tool then requirements can be imported into test modelling project and organized further without losing track of the originals. Test generation service was re-implemented to follow REST principles in order to become more scalable. Stay tuned for upcoming cloud based services to improve your workflow. The service is now accessible only over secure connection. Model debugging is now more effective with live coverage display. Get a quick overview of the parts of your model that were not reached by the generator. Robot framework is now first class environment with all-around support and examples included. TestCast 6.11.2 supports fully TTCN-3:2016 CL, TCI, TRI, xTRI and XSD mapping. Tool has passed successfully TTCN-3 tool conformance tests developed by ETSI STF521. This new version of TestCast includes also built in libraries for string manipulation, mathematical operations and date/time functionality which is not supported directly in TTCN-3. This functionality is supported using standardized external functions mechanism available via TRI. For more information please contact Elvior support.